I cure a ham each year. It makes lunch on Christmas day all the more satisfying and it’s easy to do. You just have to think a couple of months ahead. I earmark a leg of pork from one of our late-autumn pigs, then towards the end of October, I’ll think about getting it in the brine. I prefer to cure a whole leg of pork rather than a boned leg joint, as I like the traditional look of a baked gammon on the bone. That said, you can cure as much or as little as you’ll need. 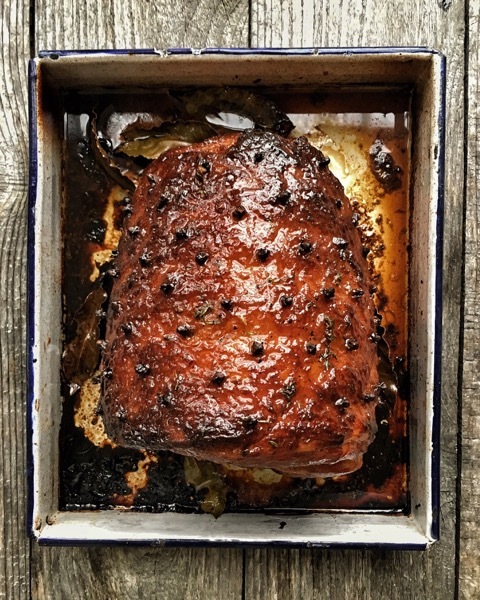 A hock of pork will cure in exactly the same way, giving you a lovely ham hock after just a week or two. Put all the brine ingredients into a large stockpot, including the spices, herbs and orange zest. Bring to a simmer over a medium heat, stirring regularly to stop the salt and sugar catching on the bottom of the pan. Simmer for a minute or two, then remove from the heat and allow to cool. Pour the brine into a big, deep plastic food box, large enough to fit your pork leg in. Chill the brine until ready to use it. You need to leave your pork in the brine for 3 days for every kilo it weighs. So if your leg of pork weighs 8kg, you’ll leave it in the brine for 24 days. If you leave it in an extra day or two, it’s not the end of the world. It might be a tiny bit saltier but you can rectify that by soaking the ham for a few hours before you cook it. When you’re ready, immerse the pork in the brine, weighing it down so it is completely submerged. Leave somewhere nice and cool – it may not fit in your fridge. After the allotted time, remove the ham and wash it under a cold running tap. Pat the ham dry with a clean tea towel and either hang it up in a cool, dry airy place or place on a tray in the fridge. I let my hams dry for 2–3 weeks before I cook them; they mature nicely over this time. However, a home-cured gammon like this can be cooked as soon as it comes out of the brine.